It was the fifth confirmed nuclear test in North Korea, and it opened the latest chapter in a long-running geologic detective story. Like a police examiner scrutinizing skid marks to figure out who was at fault in a car crash, researchers analyze seismic waves to determine if they come from a natural earthquake or an artificial explosion. If the latter, then scientists can also tease out details such as whether the blast was nuclear and how big it was. Test after test, seismologists are improving their understanding of North Korea’s nuclear weapons program. 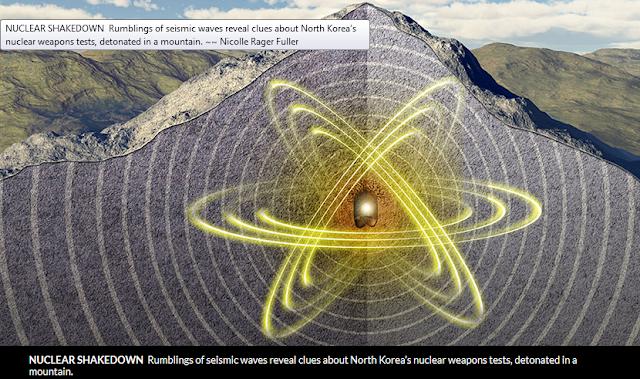 EARS TO THE GROUND Using seismic wave data, researchers calculated the likely locations of five nuclear tests in North Korea’s Mount Mantap (satellite image shown). Separately, physicists have conducted an unprecedented set of six explosions at the U.S. nuclear test site in Nevada. The aim was to mimic the physics of a nuclear explosion by detonating chemical explosives and watching how the seismic waves radiate outward. It’s like a miniature, nonnuclear version of a nuclear weapons test. Already, the scientists have made some key discoveries, such as understanding how a deeply buried blast shows up in the seismic detectors. The more researchers can learn about the seismic calling card of each blast, the more they can understand international developments. That’s particularly true for North Korea, where leaders have been ramping up the pace of military testing since the first nuclear detonation in 2006. On July 4, the country launched its first confirmed ballistic missile — with no nuclear payload — that could reach as far as Alaska. Forensic seismologists work to distinguish a natural earthquake from what could be a clandestine nuclear test. In March 2003, for instance, seismometers detected a disturbance coming from near Lop Nor, a dried-up lake in western China that the Chinese government, which signed but hasn’t ratified the test ban treaty, has used for nuclear tests. Seismologists needed to figure out immediately what had happened. By analyzing seismic wave data from monitoring stations around the region, seismologists concluded the North Korean blast had come from shallow depths, no more than a few kilometers within the mountain. That supported the North Korean government’s claim of an intentional test. Two weeks later, a radionuclide monitoring station in Yellowknife, Canada, detected increases in radioactive xenon, which presumably had leaked out of the underground test site and drifted eastward. The blast was nuclear. Researchers got some answers as North Korea’s testing continued. In 2009, 2013 and twice in 2016, the government set off more underground nuclear explosions at Punggye-ri. Each time, researchers outside the country compared the seismic data with the record of past nuclear blasts. Automated computer programs “compare the wiggles you see on the screen ripple for ripple,” says Steven Gibbons, a seismologist with the NORSAR monitoring organization in Kjeller, Norway. When the patterns match, scientists know it is another test. “A seismic signal generated by an explosion is like a fingerprint for that particular region,” he says. With each test, researchers learned more about North Korea’s capabilities. By analyzing the magnitude of the ground shaking, experts could roughly calculate the power of each test. The 2006 explosion was relatively small, releasing energy equivalent to about 1,000 tons of TNT — a fraction of the 15-kiloton bomb dropped by the United States on Hiroshima, Japan, in 1945. But the yield of North Korea’s nuclear tests crept up each time, and the most recent test, in September 2016, may have exceeded the size of the Hiroshima bomb. This U.S. atmospheric nuclear test took place in April 1953 in Nevada. No surprise, North Korea’s buried tests are harder to spot. One big puzzle arose after the 2009 test. Analyzing the times that seismic waves arrived at various measuring stations, one group calculated that the test occurred 2.2 kilometers west of the first blast. Another scientist found it only 1.8 kilometers away. The difference may not sound like a lot, Gibbons says, but it “is huge if you’re trying to place these relative locations within the terrain.” Move a couple of hundred meters to the east or west, and the explosion could have happened beneath a valley as opposed to a ridge — radically changing the depth estimates, along with estimates of the blast’s power. Seismic: 170 stations worldwide monitor ground shaking to identify the location, strength and nature of a seismic event. Hydroacoustic: 11 stations listen in the oceans, where sound waves can propagate far. Infrasound: 60 stations detect low-frequency sound waves inaudible to humans. Radionuclide: 80 stations sniff for radioactive particles dispersed in the wind after a test. When Gibbons’ team corrected for the varying distances of the seismic data, the scientists came up with a distance of 1.9 kilometers between the 2006 and 2009 blasts. The team also pinpointed the other explosions as well. The September 2016 test turned out to be almost directly beneath the 2,205-meter summit of Mount Mantap, the group reported in January in Geophysical Journal International. That means the blast was, indeed, deeply buried and hence probably at least as powerful as the Hiroshima bomb for it to register as a magnitude 5.2 earthquake. “One side of the mountain is much steeper,” Reiter explains. “The station in China was sampling the signal coming through the steep side of the mountain, while the southern station was seeing the more shallowly dipping face.” This difference may also help explain why data from seismic stations spanning the breadth of Japan show a slight difference from north to south. Those differences may reflect the changing topography as the seismic waves exited Mount Mantap during the test. But there is only so much scientists can do to understand explosions they can’t get near. That’s where the test blasts in Nevada come in. The tests were part of phase one of the Source Physics Experiment, a $40-million project run by the U.S. Department of Energy’s National Nuclear Security Administration. The goal was to set off a series of chemical explosions of different sizes and at different depths in the same borehole and then record the seismic signals on a battery of instruments. The detonations took place at the nuclear test site in southern Nevada, where between 1951 and 1992 the U.S. government set off 828 underground nuclear tests and 100 atmospheric ones, whose mushroom clouds were seen from Las Vegas, 100 kilometers away. For the Source Physics Experiment, six chemical explosions were set off between 2011 and 2016, ranging up to 5,000 kilograms of TNT equivalent and down to 87 meters deep. The biggest required high-energy–density explosives packed into a cylinder nearly a meter across and 6.7 meters long, says Beth Dzenitis, an engineer at Lawrence Livermore National Laboratory in California who oversaw part of the field campaign. Yet for all that firepower, the detonation barely registered on anything other than the instruments peppering the ground. “I wish I could tell you all these cool fireworks go off, but you don’t even know it’s happening,” she says. Technicians lower an enormous canister of explosives into the ground in southern Nevada for a chemical explosion — part of the Source Physics Experiment series — to mimic the physics of nuclear blasts. The results revealed flaws in the models that researchers have been using for decades to describe how seismic waves travel outward from explosions. These models were developed to describe how the P waves compress rock as they propagate from large nuclear blasts like those set off starting in the 1950s by the United States and the Soviet Union. “That worked very well in the days when the tests were large,” Walter says. But for much smaller blasts, like those North Korea has been detonating, “the models didn’t work that well at all.”Walter and Livermore colleague Sean Ford have started to develop new models that better capture the physics involved in small explosions. Those models should be able to describe the depth and energy release of North Korea’s tests more accurately, Walter reported at the Denver meeting. For now, the world’s seismologists continue to watch and wait, to see what the North Korean government might do next. Some experts think the next nuclear test will come at a different location within Mount Mantap, to the south of the most recent tests. If so, that will provide a fresh challenge to the researchers waiting to unravel the story the seismic waves will tell. “It’s a little creepy what we do,” Reiter admits. “We wait for these explosions to happen, and then we race each other to find the location, see how big it was, that kind of thing. But it has really given us a good look as to how [North Korea’s] nuclear program is progressing.” Useful information as the world’s nations decide what to do about North Korea’s rogue testing.